We and The Dog were out visiting Stella and Russell, to say “Hi!” to Laurie at his birthday barbecue yesterday. The Dog gets on very well with Jessie and Lola, the two miniature Schnauzers at whose house said barbecue was taking place. While we humans sat around and ate sausages and burgers the three dogs went mad all over the lawn, running and rolling around, as dogs do. When we came to go home we noticed that The Dog had developed a pronounced limp. So, we excused her from this mornings walk. So as not to hurt her feelings by leaving her behind, we decided to stay home too. We made an appointment for her with the vet – or the Dogtor as Jackie has named him and came home with some stuff to squirt on her dinner. He thinks she may have just sprained her wrist. This means that we don’t have a photo from today to show you so here’s one I prepared earlier. 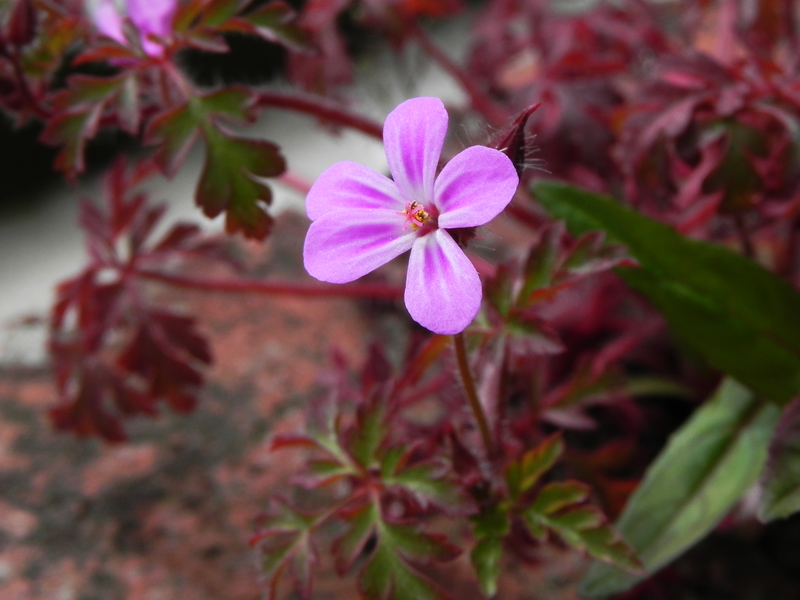 This is Herb Robert. Some people that Google knows, think that it was named after a monk who grew it in the monastery garden, but none of them seem to know just which monk or which monastery. It is a member of the Cranes-Bill family, a sort of Geranium and if you crush the leaves they give off the smell of burning tyres, hence its other name of Smelly Bob. Used as a herb, the feeling is that it provides the body with Germanium so, here we have a Germanium Geranium.